I come from the province Shanxi in China. In my province there is a very famous winery “Grace Vineyard”. While most people still prefer drinking beer and Chinese spirits, wine has become increasingly popular in my country in the last decade. I completed a Bachelor of Biological Science at Shanxi Agricultural University. During my degree, one of the subjects I studied was about winemaking. I enjoyed those lectures very much and was impressed that there are so many fascinating things happening during winemaking. I guess that was the starting point for my interest in wine! We had an internship during third year where we went to different factories that all involved fermentation – wine, spirit, vinegar and even soy sauce. At that time I didn’t know there were so many people around the world doing research in viticulture and oenology. After further study in Melbourne, I started work for a wine organisation as a function organiser. The job broadened my horizons in to the wine world. During the work I received many chances to go to wineries in Victoria, meet people from the wine industry including winemakers, viticulturists, sommeliers and wine distributors. We hosted events such as gala dinners matching food and wine and had wine education courses and tours for people at different levels. At the same time I completed Wine and Spirit Education Trust (WSET) courses level 2 and 3, and I thought I was ready to start a career in wine. I received some job offers in Beijing, but suddenly I was confused about the future. Then an idea came to my mind, how about wine research? 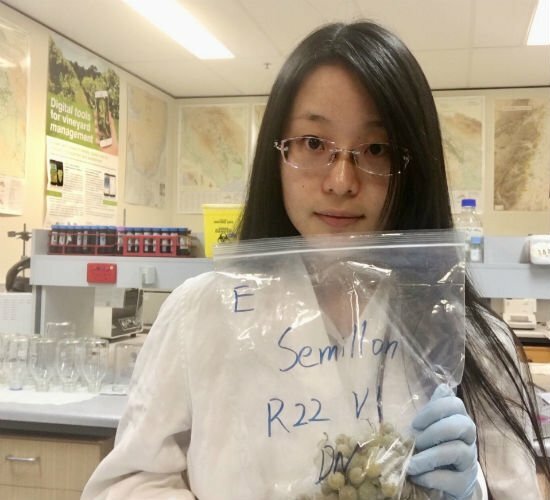 In the last year of my Bachelor’s degree, I completed a research project on ‘The response mechanism of antioxidant enzymes in soybean leaves to drought stress and re-watering’. The memories of working in a lab and growth rooms were still fresh. I had also spent time during summer holidays as a teenager helping in my sister’s lab. It was so much fun, so I decided to combine my background of biological science with wine and go in to wine research. Most of my family are researchers, so my parents were quite happy for my decision! I completed a Masters of Philosophy at the University of Adelaide from 2016 to 2018. The project investigated the influence of canopy management on reproductive performance of grapevine. My Masters principle supervisor Cassandra Collins is such a great mentor, instructor and friend. With her help I gained knowledge and skills in both the field and lab, especially for canopy management and bud fruitfulness. The results of the project were very interesting and could be practical and useful for grape growers. I was still passionate about the topic and I wanted to continue doing research in this area. 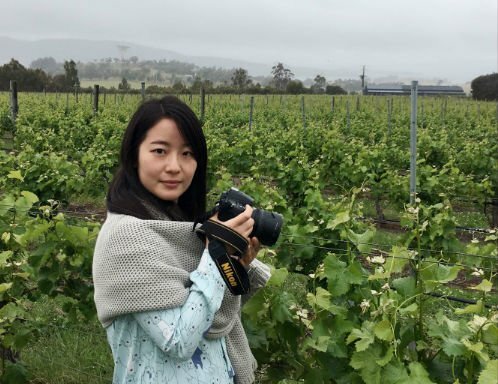 I applied for a PhD position in the ARC Training Centre for Innovative Wine Production and started in December 2018. It is a very challenging but exciting journey ahead. The title of my PhD project is “Molecular genetic control on grapevine bud fruitfulness”. Bud fruitfulness is a key component of the reproductive performance of grapevine as it can greatly effect yield variation. In my Masters project, we found that microclimatic factors, such as light interception, could affect yield potential by changing the number and size of potential bunches. In the current project I will explore bud fruitfulness from a molecular genetic perspective. Understanding the genetic control of the developmental process will be helpful in grapevine breeding and for the management of vineyards to regulate yield and ensure consistent production under the current global warming situation. We will investigate the effects of different temperature regimes on bud fertility and bunch architecture, and determine the importance of key genes involved in inflorescence induction and development. I prefer not to see too far in to the future, but rather keep it surprising and fresh. The world is so big and sometimes it’s good to try different things. I have changed my way in the past and probably will again. In the near future, I would like to see myself being busy in the laboratory and at my desk, storing knowledge and enhancing my technical skills. I feel lucky and really cherish the opportunity from the ARC Training Centre for Innovative Wine Production and I hope to make the most of the PhD experience to build a sound foundation for becoming a better researcher.